I remember when I graduated from high school, my parents bought me my very first set of luggage - Samsonite. We had always had a mishmash of luggage, but our Samsonite luggage was always the best. It held up longer and traveled better than anything else we had. That luggage lasted me about 12 years - and a LOT of traveling. As the parent company of American Tourister is Samsonite, I'm confident that my American Tourister will be well loved and last just as long! 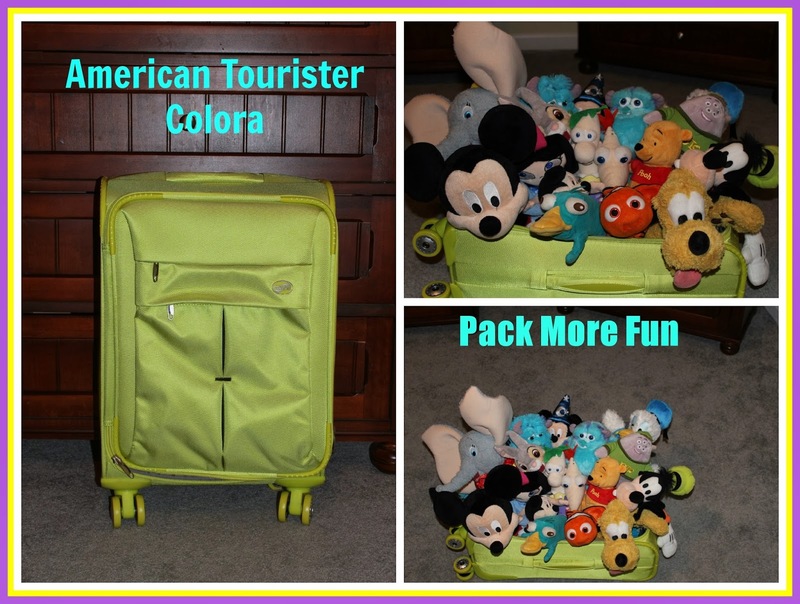 The American Tourister Colora suitcase that I received is a 20" lime green spinner. Unlike older wheels that an only be dragged behind you, often getting caught on other people or chairs, the spinning wheels allow you to move it sideways along with you as you walk - which is SO much easier to do going through a busy airport! Though I haven't traveled with it yet, I've seen how much it can fill - and it's a LOT! Unlike many small 20" bags, this one fits a lot and is lightweight. My previous favorite carry on suitcase (a Mickey Mouse one) was adorable, but so heavy I couldn't actually put anything in it! It's actually obsolete due to the hard shell. Even though it was 20" the shell took up so much of the room, it left little for anything, and as soon as you put anything in it, it exceeded the airlines weight limit! But, this Colora Spinner is deep - the dimensions are 20.0" x 14.5" x 8.5" - and the material is durable yet doesn't take up much of those 8.5" so you can fill them up with so much more than any other 20" bag that I have! I mean seriously, look at how many plushes tried to hop in for a ride? The outside zippers are great for those extras - magical express tags for the trip home, or other small last minute things you may have forgotten to pack! There is a detachable bag for toiletries, or whatever you may choose. The bottom has straps that you can hold your clothes down with to make more room and there is the zippered dirty-clothing on the inside of the lid (at least that's what I use it for - dirty clothes or running shoes!). That's a LOT of room! I believe that this may be the perfect carry on bag, but since I generally travel with 2 children, it will be a great suitcase that we'll check along with everything else! And, the best part? Now that American Tourister is the official luggage of Walt Disney World and Disneyland, it's like carrying around a hidden mickey! Make sure to check out their facebook page! Wow! You can fit a lot of the little guys in this bag!! Love the color and you are so right about spinner wheels. I couldn't agree more. It is just the right size for a carry on and look at all the stuffed friends that could go along on the trip! I love your picture with all the plushies in your suitcase - that is just adorable! I'm impressed with the capacity of this bag as well! I love the characters in the bag! :) My favorite part is the detachable bag! I love that feature! Cute pic with all the Disney pals! I know my kids will pack some of their pals in ours too! I love those spinner wheels too--makes it much more maneuverable. What a great review, Jenn! Good job writing it and sharing all of your Disney plush animals with us! You really can pack a lot into the bag! I love that it has a detachable toiletry bag. Loved your review, Jenn. You gave great insight to the bag and I loved all the plush animals in it, There is room for a lot. My kids will love to know they will be able to pack a lot of their Disney friends to take with us to WDW. I am so excited about this partnership. 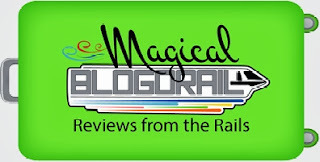 These two companies make traveling so fun! Who can pass up a bag that has room for Mickey and gang! I have my original Samsonite luggage too (circa 1980)!! I agree, the quality can't be beat. And that color is SO exciting- we'll never miss luggage on the carousel again! My husband and I registered for Samsonite spinners - and we love them. But this bag brings and extra kick to it and I couldn't love it more. Thanks for sharing! Thanks! It was fun to try to organize them the right way!! Yeah it definitely seems to fit a lot! Thanks!! It was fun - I stole them from my boys beds - they compete over who has more on their beds! Yeah so smart to have the detachable bag - hopefully I'll have an easier time finding my toiletries! Yeah spinner wheels are definitely the best feature on luggage! So much easier to slide along than drag behind! Thanks Mike!! Thanks for stopping by! I think it's going to be perfect for my next real trip... now to plan a flight somewhere good! Thanks Diane! That bad definitely has a lot of room without added bulkiness - perfect! Definitely a great partnership! Those are 2 fantastic companies for sure! That's awesome! Is the 1980 still kicking? I remember the ones we had as kids were super heavy - probably impossible to check on a flight without costing a ton in extra baggage costs! Great registry idea!! Thanks for stopping by! How funny - I guess my parents weren't alone in their practical gift giving! Good plan on upgrading! I love that: "it's like carrying around a Hidden Mickey!" Those spinner wheels are great for getting down the narrow plane aisle as you board. Turn it sideways and roll right along! I never knew Samsonite Made American Tourister. LOVE spinner wheels!